Real estate development is a subject that I have 'worked' on for thirty years. Yet when you search for information on How To Do It, you find almost nothing until I wrote my ebook. 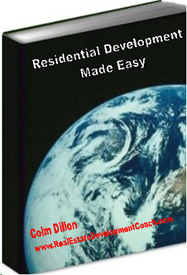 Author of "Residential Development Made Easy"
Having "30 years and $1.2 Billion" worth of professional real estate development experience under my belt, I wrote Residential Development Made Easy. It is above all ... a Practical Ebook ... not theory; you can go to University for that stuff. It is an ebook for you to study, because I not only want to teach you how to "talk the talk" of development, but also how to "walk the talk." If you want to learn about real estate development, (in some places they prefer the words property development) ... if you want to learn about real estate development, you are going to come up very short indeed if you look in the library or on the web. The answer is simple. The guys 'who know' about real estate development are making lots of money and prefer to leave buildings behind them, not instruction books ... besides, many think, "I learnt the hard way; you can as well!" The guys who write books are more academically inclined and write studious volumes for Master Degree types. So once again, I'm out of step. Because I'm not an academic and I have spent 30 years as a professional developer. However I do enjoy writing and I love the idea of passing on the knowledge that has made my life such a good one. These answers will help you quickly find out if my ebook will help you or not. Colm, I live in Cape Town, in Sydney, in Toronto, in LA, in Birmingham ... wherever ... will your real estate development eBook work where I live? After all, you live in Australia! As long as you live in a Free Enterprise economy, then the way we go about real estate development is the same everywhere. The only differences between, where you live and where I live, are the Local Authority Rules & Regulations ... Not How We Go About Real Estate Development. What you can build on a 1,000 square metre (square foot) piece of residential land will be different, not only from country to country, but also from City To City in the same country. It is the local town plan that determines these capacities, OK. Can you see that point? Here's a better example ... Building Regulations. Can you see why Building Regulations would be different in the sub-tropical climate of Brisbane and the freezing temperatures experienced in Canada? I hope those two extremes in temperature make the point for you.
. It is the local Council or the Local Authority's Rules & Regulations that differ. Can I buy your ebook in hard copy? Publishers are interested in Sales Numbers. I'm interested as well ... but not as interested as they are. This book would never get off the ground if it had to be published in hard copy. The fact is that there are a limited number of people interested in learning about real estate development. Example: how many people do you know who are "knowledgeable about", or even "really interested" in real estate development. I said 'development' not real estate. Go on ... one hand will do ... how many fingers are you holding up? So my friends, people who want to learn 'real estate development' are very thin on the ground ... and why not, entrepreneurs who 'take charge of their lives and make things happen ... are thin on the ground. And Finally: The cost of printing, packaging and postage would be so high that you would not pay the money and I would not have written it in the first place. The web is world wide and is the easiest and cheapest way to get my book to the people who need it. You've developed $1.2 Billion worth of projects ... I only want to develop small projects. I'm worried that your ebook might be over my head ... a bit to complicated. To be able to write an instruction book or ebook, you need to have an authority and experience base, or why would anyone listen to you, OK? To develop $1.2 Billion worth of property for listed stock exchange real estate development companies give me that base. But if you were to examine all my projects you would find small real estate development projects, as well as large. We all start at the bottom and don't leap to $400M projects straight away. So to write on the subject I need, not only to know the subject, I need to know the twists and turns as well, and most importantly, be able to explain it in language you will understand. Out of 54 countries I have not had a question asking clarification of a topic or sub-topic to date. Residential Development Made Easy is 126 pages long. It arrives in your computer in a 1.78mb zip file after an Immediate Download. Once you open the file, you can go to FILE ... Print and away you go. Actually it is better to print a small number of pages at a time ... like pages 1 to 19, then 20 to 39 etc. I have found that with some printers there is so much info in the ebook, that the printer's memory can't hold all the data at once. So easy as you go, OK? Phew: Thanks for letting me get those questions out of the way ... readers ask them all the time. Most people go into residential real estate development on a ‘search & explore' basis; where just about every mistake costs them $Thousands. Now I don't blame them, because there is such a deplorable lack of information and people 'who know' to teach them. My ebook will Save You $Thousands + Valuable Time. Then That Is The Worst It Will Ever Be." Sorry to be so Blunt ... but it's just got to be said. You see most people don't realize that real estate development has a process and many procedures to be followed ... in fact, in my ebook, I believe for the first time ever, I have created a "Road Map" (Development Work Flow Chart). If you want to get you project from A TO Z, you need to know about the little a1, a2, a3 etc ... plus b1 to b7 and so on. However, you also need to know that while you are doing c4 (which takes some time, not yours, someone else’s you've employed to do it) you can get on with f3 and finish off b6. And that is how you get your real estate development1 finished at 'Z' on your real estate development 'Time Line'. Does that make sense to you? Right now, I bet many of you don’t know about any of this stuff. And that is how a big real estate development or a small one is finished on time and on cost. Forget about the size of the $figures ... our goals are the same ... get our $500,000 project or our $100,000,000 projects finished on time and on cost. Plus that $500K is just as important to you, as the $100m is to the professional ... it's the number that are different ... that's all. I've said just about all I have to say to you as an introduction to my ebook. Let's Get To Your Specific Real Estate Development Needs. You don't need to read about stuff that doesn't address your immediate needs. So make a selection below, that best describes what your interest’s are. The cost of my E-book may be tax-deductible, as an expense for your investment education. This deduction is normally available to US residents (for readers in other countries, please consult your tax agent). The receipt for your records will be immediately emailed after purchase. "I Am A Beginner And Want To Learn Development. "I Want To Develop A Small Apartment Block Or Townhouse Complex. Will Your Ebook Help Me?" "I Want To Buy Land To Subdivide And Sell Individual Lots. Is This Feasible? " "I May Need To Joint Venture With Someone To Get Started. What Do You Think? " "I've Done A Few Developments, But They Should Have Made More Money - How Do I Improve Performance?" This is a digitally-delivered product, which means you can start using the course right away... no waiting for shipping! You can start using my method in a matter of minutes! Learn Real Estate Development "The Right Way The First Time"